Welcome to Day #14 of Chocolate and Mint Theme Week, and Day #1 of Chocolate and Flowers Theme Week. 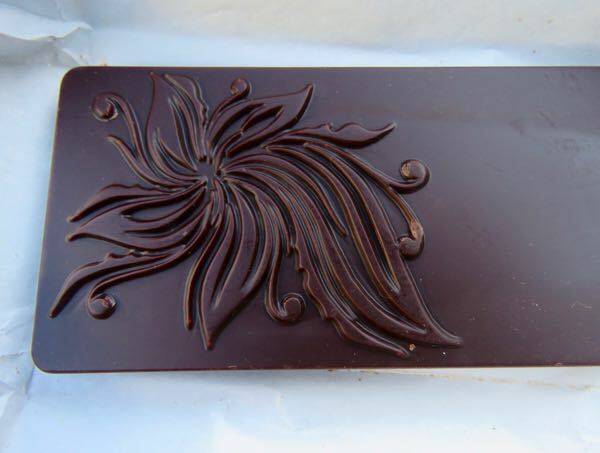 Vasa created a line of raw, Ayurveda Inspired Artisanal Chocolate. Her chocolates are handmade in small batches, with no refined sugar, dairy, soy/emulsifiers or preservatives; and they're sweetened with local honey. She used Fair Trade organic cacao sourced from Peru in today's bar. Today's 70% cacao Peppermint infused with Lavender bar was made with raw cacao butter, raw honey, raw cacao powder, peppermint essential oil, lavender essential oil, organic lavender flowers, and Himalayan sea salt. This relaxing, but invigorating (is this possible?) chocolate was firm (it broke with a snap); yet, had the buttery melt of a truffle. Lavender buds and oil were well balanced with the mint and provided a natural tasting, balanced floral and herbal experience. 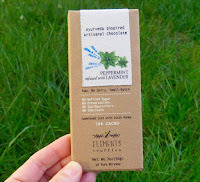 The chocolate had a pleasing lavender finish, and was designed to support Vata and Pitta ayurveda doshas. Loved that it was not ultra-sweet. The amount of honey used was just right, and didn't overpower the other elements/inclusions. *25% of proceeds go towards education of underprivileged children.